October is National Cyber Security Awareness Month (NCSAM). 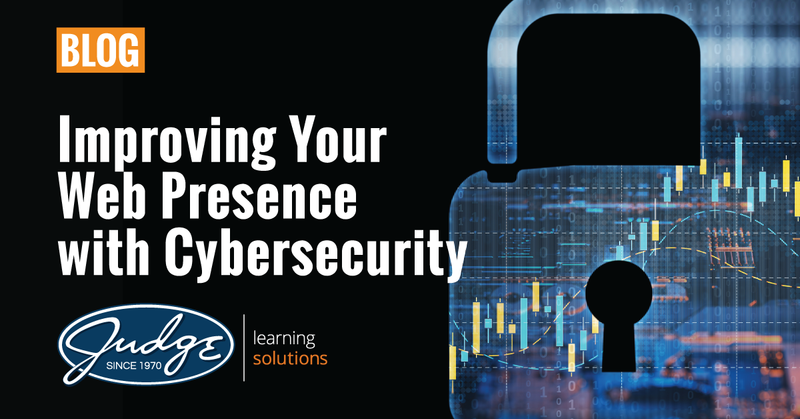 This year, Judge Learning Solutions' cybersecurity blog is all about improving your web presence. Your website often provides prospective customers with their first impressions of your company. It also impacts your image with existing customers. Maintaining a website that is feature-rich and aesthetically pleasing is important for attracting and retaining customers. But maintaining the safety and integrity of that website is absolutely critical. Think back to last year’s Equifax debacle. Recent statistics state that nearly 148 million people were affected when Equifax failed to apply a readily-available fix for a known security problem. Their stock prices and reputation still haven’t fully recovered. During the first half of 2018, a multi-national retailer, several luxury retail brands, a major international airline, and many other well-known companies have reported data breaches, shaking the confidence of their customers. When a pharmaceutical site wasn’t managed properly in 2014, millions of people received rampant spam emails for one of the company’s most important products, causing many potential consumers to block any email that included that product’s name. This is still an ongoing marketing nightmare. Another cybersecurity issue that affects a company’s web presence is when a cyberattacker floods a website with so much traffic, usually through an automated process (botnet), that the system crashes or legitimate visitors cannot get through. This is called a Distributed Denial of Service attack, or DDoS. This happened last year to one of the largest pharmaceutical companies in the world, when its entire system was held hostage by ransomware. Incidents like these damage a company’s reputation. It only takes one unsecured website to open the door for cybercriminals. That’s why it is so important to ensure that you fully manage your websites. Keep your software updated and phase out software that is no longer supported or maintained by its vendors. Register your websites to your company, not to individual employees, so that you avoid legal ownership issues that may hinder your ability to manage those sites. Only publicize a new website after registering all variations of that website’s name. Consider using an external security rating service, such as RiskRecon, MetricStream, or Lockpath to help you evaluate and monitor your cybersecurity risks. Furthermore, make sure that you educate your employees on best practices for minimizing cybersecurity threats to your organization. Use a combination of learning and change management strategies to ensure that your employees safeguard your company’s web presence. If you need help with designing and implementing effective strategies, please contact Judge Learning Solutions using the form below. We would be glad to help. Cybersecurity is everyone’s responsibility. During this October, and every month, make sure that you are doing your part to protect our virtual, global community!